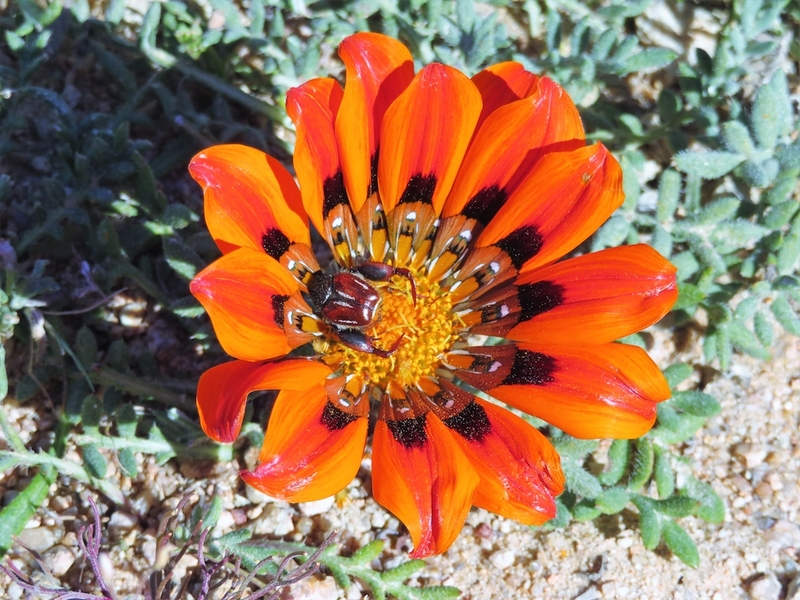 The flowers of Namaqualand draw travellers from all over South Africa, as well as overseas. 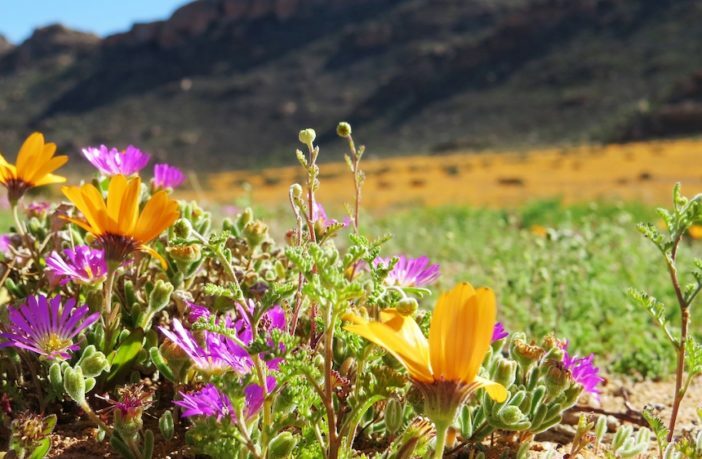 These areas on the West Coast, Cederberg and into Namaqualand receive little rain throughout the year, but after the winter rains, the normally dry landscape explodes with colours as wild flowers such as gousblomme, vygies, nemesias, lachenalias, babiana and ixias start to bloom. The peak flower season is usually late July to August, so if you want to take a trip this year, make sure you start planning as soon as possible. In 2017, South Africa experienced a drought, and the flowers in Namaqualand were few and far between, a shadow of what we are used to. 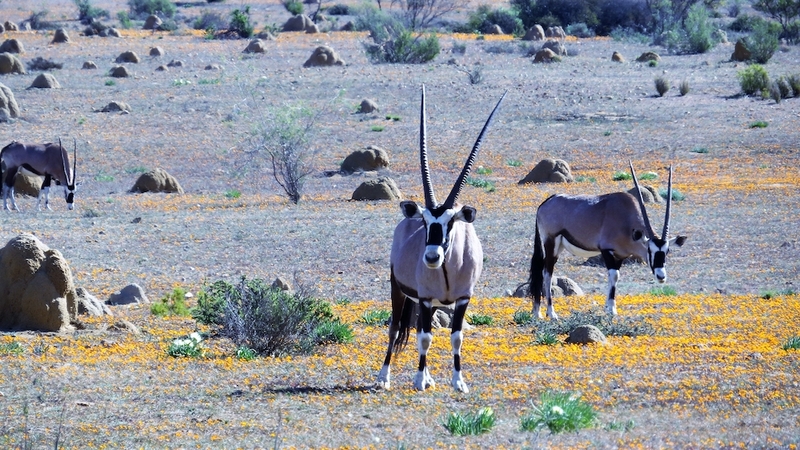 Margaret and David Wynne sent us this story of their flower-viewing tour from 2017, when they joined Jannie Rykaardt of Protea Safari Tours on his Namaqualand tour. 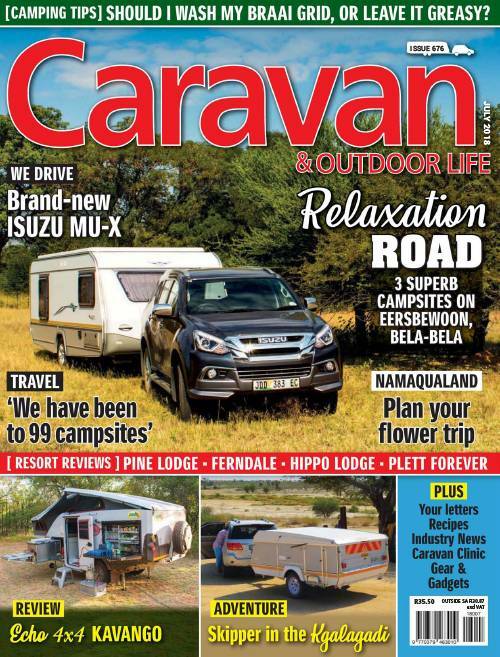 I spoke to Jannie regarding his 2018 trip, and says they are expecting good flowers this year, as the first rains had already started falling in June, a good sign! Little did our safari guides, Jannie and Ansu Rykaart of Protea Safari Tours know when we set out, but three years of drought (or much lower than average rainfall) in the western half of South Africa would mean that this year’s flower hunters would have an unusually exciting and challenging eight days as they travelled through the spectacularly arid Namaqualand countryside in search of those special spring flowers. 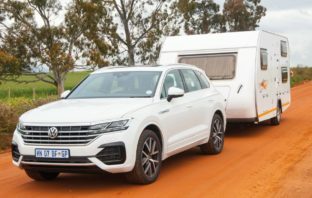 Our group of eight, in four vehicles, met up for the first time on 24 August to overnight at the Slypsteen Guest Farm, off the N10, about 28 km outside Groblershoop. 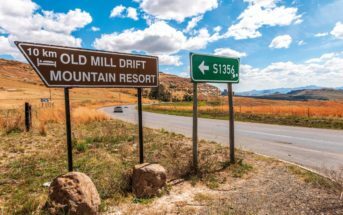 The setting for the chalets and the restaurant building is absolutely divine, perched right on top of a jagged metamorphic rock koppie, and overlooking the tree-lined Orange River, the farm dam, the irrigation canal and neatly trimmed vineyards on the river floodplain. We were first to arrive, and after being greeted by host Ryna Blauuw, grabbed our camera and wide-angled lens to capture the beauty around us. With my geology background, I was soon scratching around picking up the most interesting rock and mineral specimens! We gathered on the veranda for sundowners and a “meet and greet” (with Jannie’s complimentary Beyerskloof red wine flowing freely) – it was immediately obvious that our fellow flower companions, whom we had not previously met, were the nicest folk! 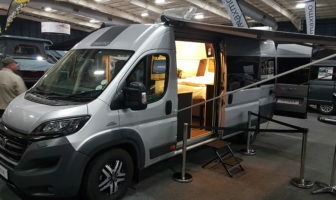 Friendly, up for any adventure, full of life and quick with a joke. We had not laughed so much for years, and this was to continue for the next seven days! 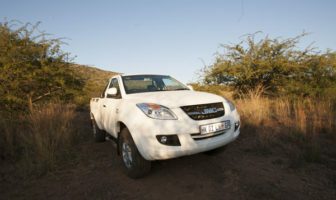 On their longer safaris, Protea Safari Tours always has gifts for the clients. This time the men received the most beautifully monogrammed bush shirts, whilst the ladies could cuddle up in their warm blankets with a Namaqualand daisy embroidered in the corner. 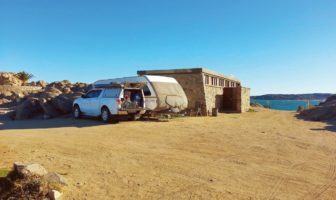 Our vehicles were not forgotten, and we all sported colourful decals on the doors proclaiming the “Namaqualand Flower Safari 2017”. After a delicious supper, Jannie explained the programme for the next day, and we retired with the rest of the evening to relax. We rose early to greet the sunrise, listened to the many bird calls on the air, and watched a graceful and opportunistic grey heron standing at the side of the irrigation canal waiting for a fishy meal. 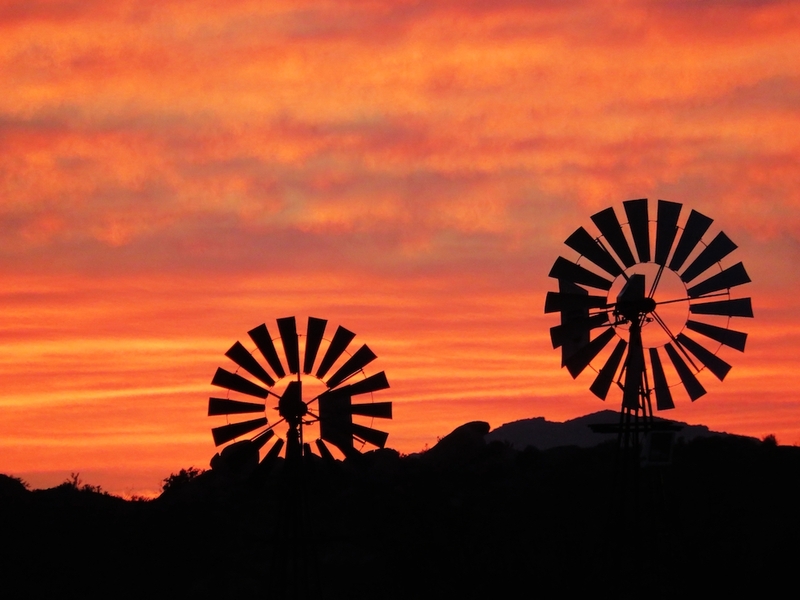 After a good breakfast, and the chance to wish “Rassie” Erasmus a happy 60th birthday, it was goodbye to Slypsteen and off to Upington, then to Keimoes with its famous water wheel. 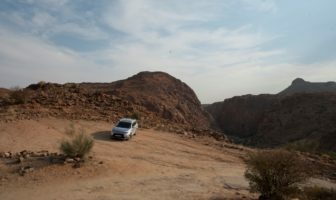 I must mention here that we were now in good radio contact with Jannie and Ansu in the lead vehicle, receiving clear instructions on where we were headed and road conditions ahead. This allowed the convoy operate very smoothly and safely. The beauty of this system is that anyone can, at any time, say they are stopping to take a photo or enjoy something that catches their eye. We stopped for coffee at the Vergelegen Guest Farm, visited the Pink Padstal just before Kakamas for curios and preserves, and then meandered down to Die Mas of Kakamas Wine and Brandy Cellar on the outskirts of town as some wanted to purchase some good wines for their friends and family. Here I saw the most unusual stemless short aloes in bloom… the foreman on the estate called them “kraaloorgie” but I have not been able to fully identify them. We couldn’t help stopping from time to time to point out interesting geological features to the rest of the group such as a massive rose quartz outcrop and dark intruded dolerite boulders, and marvel at the amazing “big sky” panoramas, the desert scenery, the enormous social weaver nests on the telephone poles, spectacular mountains and red Kalahari sands. 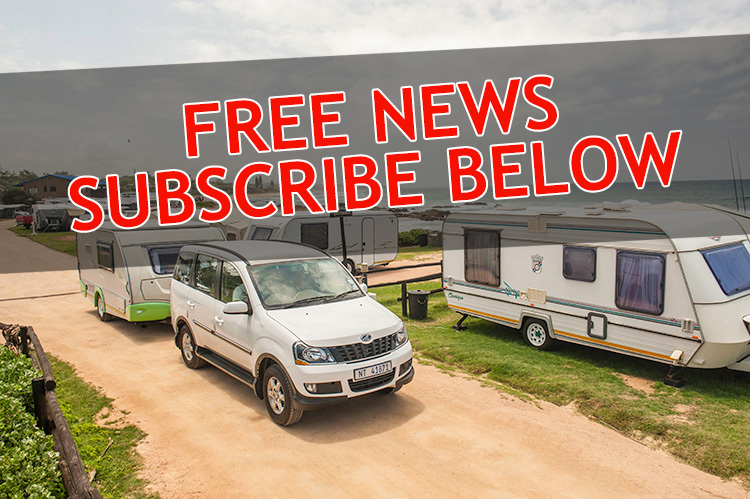 As we approached Klein Pella Guest Farm (about 270km from Slypsteen) the landscape, so harsh and dry, was dotted with some odd vegetation… masses of quiver trees (Aloe dichotoma, a tall aloe), such that we all agreed we’d never seen so many in one area! There’s also the rather unusual “halfmensboom” (Pachypodium namaquanum). Literally translated, this means “half-person tree” and the name comes from the tree’s resemblance to the human form; its top consists of a grouping of thick, crinkled leaves, generally leaning northwards, which can make it look almost like a human head. Aletta Nelson, the guest house manager welcomed us and explained a bit about the farm’s activities. Owned by the Karsten Group, it’s the biggest date farm in the Southern Hemisphere, covering 18 000 hectares on the Orange River. We were reminded that we should spend some time on the farm and relax as we were on holiday! Breakfast was served at 08:00, and after purchasing some boxes of dates, we decided to take “the road less travelled”, a single track along the banks of the Orange River, to the Catholic mission station at Pella. 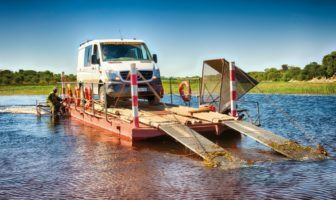 The Manager had given Jannie a hand-drawn “map” on a scrap of paper, and off we went, us in a Toyota RAV 4 all-wheel-drive and the others in their trusted 4×4 Mitsubishi Pajeros. What an incredible slow three hour adventure into changing scenery it was; past the Klein Pella date palm groves, down to the very banks of the river where five fisherman had set up a rustic camp, rods perched for (hopefully) the first catch of the day, and bumping through a mountainous desert landscape characterised by rugged kloofs and high mountains on one side and flat, sandy, river plains on the other. It is so obvious that this arid area represents a harsh landscape where water’s a great scarcity and only the hardiest of life forms survive. There were spots where shepherds had tried to eke out an existence, but rudimentary animal kraals and little shacks now stood forlorn and abandoned. Before we left the farm, we were told that this rugged area had been used as the film set for stories set in Sudan or Afghanistan and it’s easy to see why, as the similarities are staggering. The village of Pella is an oasis (earlier known as Cammas Fonteyn). The spring was used by the San people. The area had been occupied by Europeans, on and off, since the early 1800’s, but the present Catholic mission station had its beginnings in 1878. The cathedral is pretty impressive, surrounded by palm trees, and there is an interesting Museum. Our journey on the N14 then took us further west to Springbok. I noted that we started to see sparse patches of flowers at the side of the road from about 30 km outside the town. Jannie had arranged for us to stay at the Daisy Country Lodge for three nights. My, we were certainly treated to 4-star luxury here by the manageress, Madre, a huge en suite bedroom, ducks and peacocks strutting about the lawns, Cape weavers building new nests outside our door and such magnificent Namaqua hospitality, it was hard to eat everything presented at each meal in the Tsamma Restaurant! Each day seemed to have a somewhat lazy start, but there was “method in our madness”, as the flowers only open once the sun is shining brightly and the temperature has warmed. 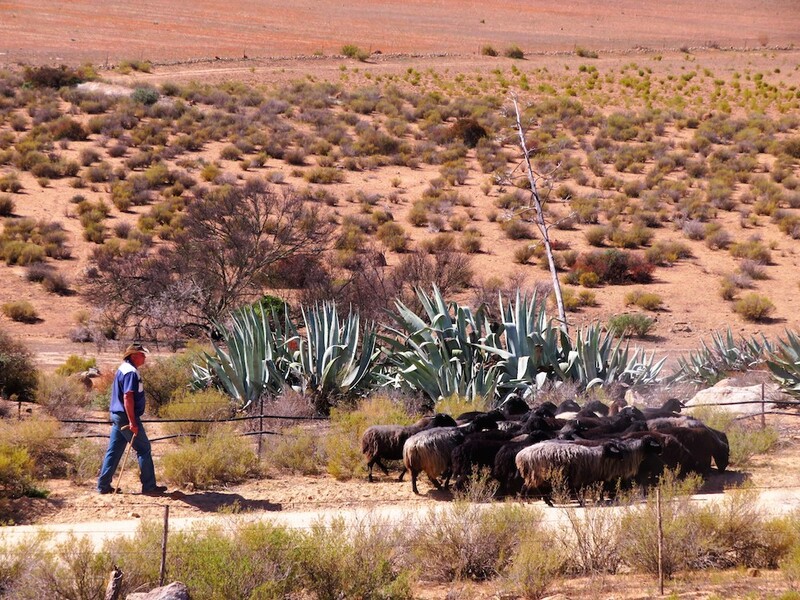 So, at 10:00 we departed for the day to Goegap Nature Reserve, about 15 kilometres east of Springbok. Of course, we were focussed on seeing the wild flower displays, but unfortunately that was not to be! The lushness of the flowering plants in spring is dependent on the winter rainfall that precedes the start of spring. However, very sadly the western half of South Africa has suffered a severe drought (or erratic, uncertain and much lower than average precipitation) for the last couple of years, and this has adversely affected the floral display in 2017. Some plains in this area that were a kaleidoscope of colour a couple of years ago were barren brown earth. But we were not deterred! We spent some time at the Goegap Visitor’s Centre marvelling at the wide and interesting variety of succulents, and wandering over a koppies bursting with quiver trees, tiny scattered flowers and succulent plants that we don’t get at home! We’d planned to spend the whole day at Goegap, but because the flowers were a disappointment (we’d heard that they were better towards Concordia), we headed off towards the historical copper mining town of Okiep which has a very rich history. Little did we know it when we arrived, but the Okiep Hotel has on its doorstep two national monuments, namely a Smoke Stack (1880) which acted as a ventilation shaft and the Cornish Pump House (1882). The Cornish Pump House is in fact a steam driven beam-engine which is fully intact and is the only remaining pump house of its sort in the southern hemisphere. Much of the old mining works are still to be found in Okiep, especially the remains of the old Cornish miners’ workings and stone masonry in the surrounding areas. At last we found a mass flower display! On the road to Concordia, we located a field with a windmill and gorgeous purple, orange and white daisies. Happy to have seen some flowers, we went to bed that night dreaming of more colourful diplays in the morning. We watched the sun rise and went for a brisk walk before we set off at 09:30 to Nababeep, another preserved copper mining town with a very interesting museum, and fabulous collections of rock and mineral specimens. We tried to find more flowers, but to no avail, and eventually returned to Springbok for tea at the Springbok Inn. I think the whole group lay down for an afternoon siesta on this day – flower hunting is hard work! A treat at supper time was to do some star gazing with Dolf Nel, a teacher at the local school, who is an enthusiastic amateur astronomer. We trooped up the hill close to the lodge, to where Dolf had set up his telescope to view the planets Saturn with clear rings, Jupiter with four of its moons, a deep space cluster of millions of stars and another star feature called ‘The Jewel Box’, as well as the moon. It was fascinating stuff. 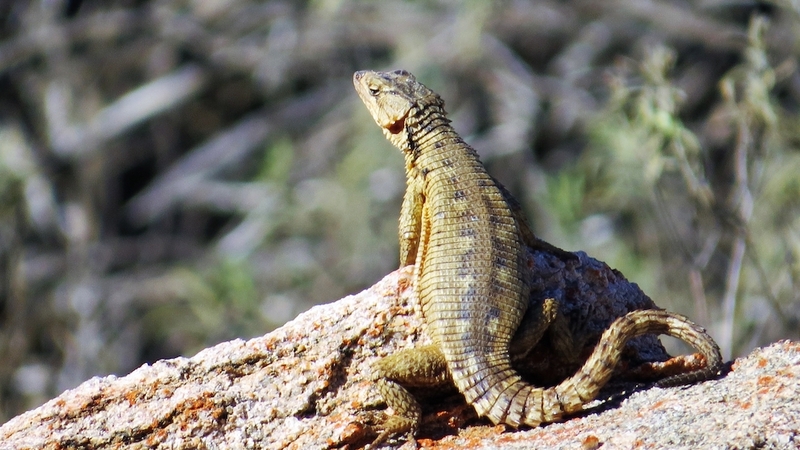 To reach our next destination, the Agama Tented Camp, about 20 km north of Garies, we all deflated tyre pressures to about 1,8 bars for the sandy roads, and took the rough, gravel surfaced bye-ways, traversing the Messelpad Pass and the Wildeperdehoek Pass, and ventured into the Namaqua National Park. It was a somewhat chilly cloudy day but what a treat to see the ocean! 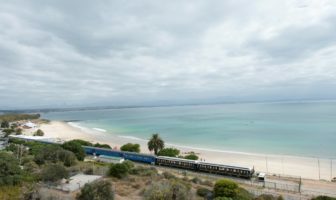 Once we got to Hondeklipbaai, we headed straight to the Dop and Kreef Restaurant on the seafront for lunch. Hondeklipbaai to Garies is about 80 km. 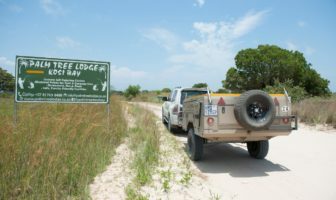 We arrived at the Agama Tented Camp at about 17:00 to be met by hosts Linda and Victor, and later their daughter/chef, Karien. 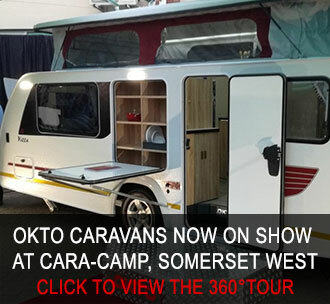 Another fabulous destination to stay for three nights, in a largely unknown and overlooked corner of South Africa! 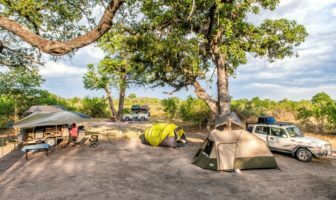 The tented bush camp takes a maximum of 14 people in comfortable tented accommodations with their own private bathrooms and spacious decks from where one can enjoy the breathtaking views. 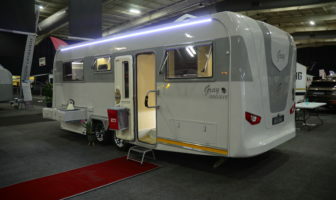 The camp does not offer electricity at the tented units; however, electricity is available at the restaurant for charging cellphones and camera batteries. The restaurant / bar was a haven of warmth with wood fires blazing and our whole group gathered round to chat and laugh and enjoy the wonderful time we were having. There is a partially domesticated meerkat at Agama – she is called “Gomgat” and had us smiling with her antics. Linda said she eats from the veld, but they give her a beaten raw egg each evening, and she makes herself at home basking very close to the fire. The coffee water in a flask delivered onto the stoep at 07:30, means the day begins. After breakfast, we headed out to Kamieskroon to visit the Skilpad Wildflower Nature Reserve, part of the Namaqualand National Park. Along the N7 route we were suddenly treated to some excellent lappe, doilies and “runners” of healthy flowers, no doubt encouraged by the water run-off from the road, with their faces turned gloriously towards the sun. Crouched down on a mat at the roadside, we came across a professional photographer, camera on a short tripod, with an umbrella to provide just the right amount of shaded light to get that perfect macro photograph. Once again as far as a flower show was concerned, the floral spectacle on the 5 km Circular Flower Route in the Park was disappointing. 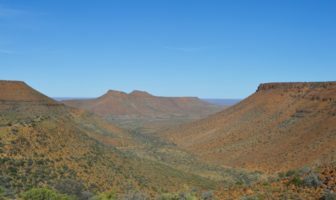 However, it was made up for by a group of beautiful gemsbok grazing peacefully amongst the blooms and we stopped to climb the granite dome called “Roof of Namaqua” and get a spectacular view over the reserve and the Kamiesberg Mountains. It was Margaret’s birthday on August 31, and we celebrated with singing at breakfast, candles and a lovely scarf present to all the ladies. Jannie decided to go to the Garies Information Bureau as the staff there are very knowledgeable on where the best sightings of flowers might be. 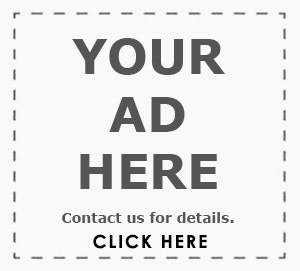 The owner, Sonja, said the area had only had 39mm of rain the whole year. She suggested we go over Sturder’s Pass and then turn right to Karas and Doringkraal. The pass gave lovely views, but the gravel road was not great. Through the Karas farm gate we spied massed purple and yellow and orange … probably the best we had seen, so we spent quite some time on photography and just soaking up the beauty. 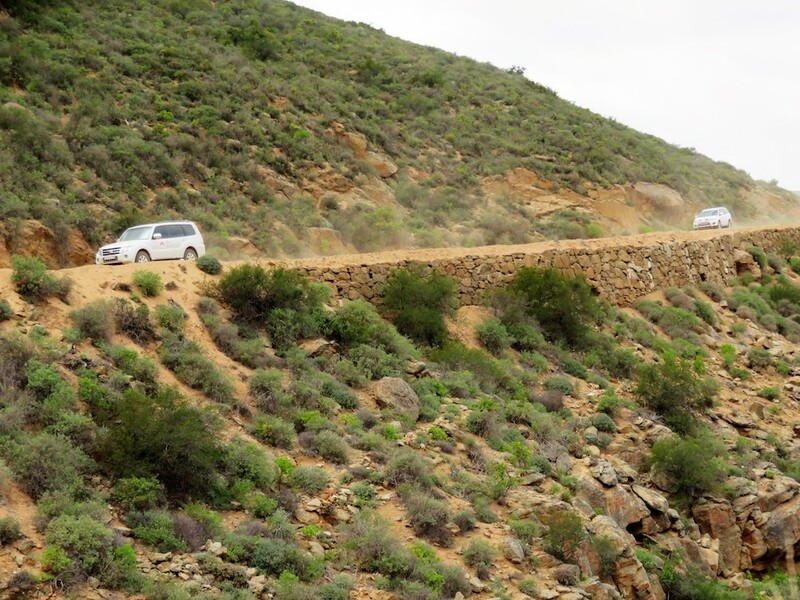 We then took the 13,7km long Langkloof Pass which lies deep in the Namaqualand Mountains and connects Garies with farming communities. We came out at Doornkraal and then made our way back to Garies. 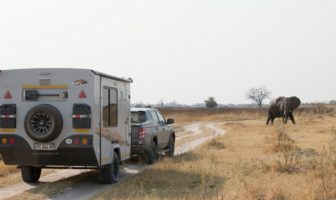 We made sure we had refuelled and reinflated our tyres before going back to Agama to enjoy the last evening with our newly found safari companions and flower friends. The first day of Spring! After breakfast we all went our own ways and started the journey back to Gauteng. 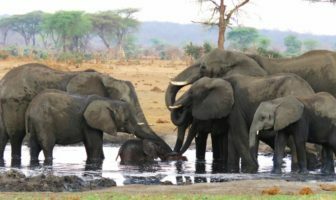 Protea Safari Tours had really come up trumps with a magnificent eight-day adventure that we will never forget. Despite there not being the endless carpets of multi-coloured wild flowers we had hoped to see, the laughter and fun during the trip made up for the lack of flora. 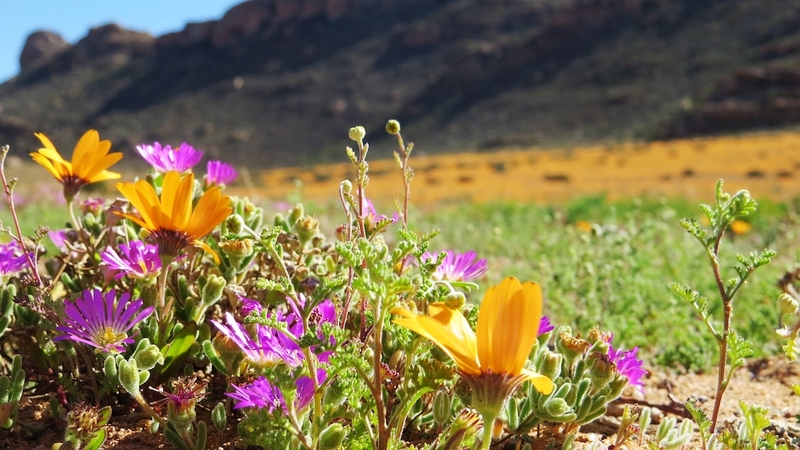 The Namaqualand area is a beautifully scenic place, even if there are fewer flowers.